When you have an unexpected financial emergency and find yourself needing an instant cash loan, most of us only ever need to borrow a small amount. Cash emergencies come in all shapes and sizes. It could be an unexpected car repair, a new washing machine or perhaps you just need to pay the rent after a temporary reduction in income. Applying for a standard personal loan often means borrowing at least £1000 when all we really need is a small loan to see us through until payday. When you borrow a larger amount of money, you will almost certainly need to borrow the funds over a longer period. Usually, standard personal loans are payable over at least 12 months. This could mean that a small cash emergency, suddenly turns into a long term financial commitment. Sometimes you just need an instant cash loan to take away the stress of the situation and deal with the immediate problem. Where can I find a cash loan up to £1000? Borrowing from friends or family can be particularly useful if you need a small amount of money. If you are confident that you can pay the loan back on time, it is unlikely you will pay any interest. If you need less than £100, this might be the quickest and most convenient option. However, if you do decide to borrow cash from family or friends and do not pay the money back on time, it could put a strain on relationships and you may find yourself in an uncomfortable position. If you think there is a chance you cannot pay back the money on time or need a larger amount, it might be worth considering other options. On almost any UK high street, you will find a short term loan provider. Many Pawnbrokers such as H&T are also offering personal loans as part of their traditional service. With a high street loan, you will need to visit the physical shop and complete your paperwork in store. If you are approved that same day, you may receive physical cash that same day. This could help you if you have a local financial commitment. Because you physically need to travel to the store itself, it may not always be convenient. If you live outside the town itself, you may have to factor time and money getting there in the first place. If the lender requires additional documentation or proof of earnings, you may have to travel back home to retrieve them before returning. This could mean waiting longer than necessary for the cash loan. If you have an urgent financial emergency, you may not have the luxury of another day to wait. For many people, borrowing from friends and family is not an option. Travelling to the high street is often not ideal either due to the time and money involved. If you have a real cash emergency and have access to the internet, an online loan application is probably the quickest way to get a swift decision. Loans amounts can range from £100 and up to £1000. You can choose to apply for cash directly with a lender, or alternatively through an online broker such as CashLady. If declined, you will need to follow it up with a lender directly to get feedback on the decision. The loan will be a bank transfer, not physical cash. You can also apply for a loan via the telephone. Most UK lenders offer customers a telephone facility. Instant Cash Loans online – How fast are they? When people search online for ‘instant cash loans’ it normally means that they need money fast. It is important to remember that although the application process for online cash loans is usually quick and easy, it doesn’t mean that a decision is always immediate. Much of this will depend on the information you have submitted and if you have met the affordability checks. So although you may be provisionally accepted for a loan online, further credit checks are commonplace and could potentially mean the money you need may not be transferred the same day. How to ensure your cash loan application is successful? Online loan applications can be a convenient way to apply for emergency cash. But you have to ensure the information you submit is honest and accurate. If you provide false information on your loan application and are approved for a loan on that basis, you could be liable for an investigation/ prosecution into fraud. Make sure that you don’t have any outstanding cash loans with anybody else, or any large credit card debts – each of these can be a telling factor when a lender decides to issue an instant cash loan. Any financial commitments or obligations can and will be taken into account. Before you apply for any type of personal loan, you should ensure that you can comfortably pay the monthly commitments. This means that you should look at all of your monthly expenses and compare to your regular monthly income. If you have this information, why not use CashLady’s affordability calculator to help you before you complete an online application. Finally – if you feel that your short term loan application was declined unfairly, speak to your lender directly and see if they can explain the reasons why. It may mean that there is some incorrect information on your credit file, which needs some attention. The success of your application depends on many factors. For example, the loan amount you choose could determine which lender matches your request. If your loan amount is too high, some lenders will not be able to lend to you for the first time. We find that most of our applications tend to range from £300-£500. Subsequent applications to lenders can go up to £1000. If your credit file has information that is incorrect, getting it removed could help you with any future loan requirements. Cash loans are a convenient way to get hold of finance when you need it most. Whether you’re facing an unexpectedly large bill or a surprise expense there are many quick loans options that will help you deal with the problem. One of the many benefits of loan applications made through CashLady is they are fast – we have streamlined the application process to maximise the chances of your application being accepted by a lender and reducing the amount of time it takes to get a decision. Our "Instant loan" process offer customers fast cash solutions once their online loan application has been accepted by one of our lenders. Whether you’re applying for a payday loan, personal loan or line of credit you will find out as soon as you apply if there are lenders interested in providing you with the money you need. Even if you are looking for small cash loans specifically for bad credit, we may be able to find you an alternative. After that, it’s just a few steps towards full loan approval and transfer of funds. Once you have been approved by your lender the cash loan will be transferred to your bank account as soon as possible – sometimes this is completed in a matter of minutes. Employed with a regular salary (so you can repay the money that you borrow). Repayment depends on the type of loan that you choose. For example, a payday loan is normally repaid when your next pay cheque arrives in your bank account – usually 30 days from the date that you borrowed the money. Read more about cashlady online loans. For longer-term personal loans, loan repayments could be anywhere from three months to twelve months, although some lenders will offer even longer repayment periods. Customers looking to spread the cost over longer periods will usually do so because they need a larger sum of money. If you are looking to simply make the smallest monthly repayments and believe a smaller loan over a longer period will help, look closely at the amount of interest you will pay. With small cash loans often having higher levels of interest, a longer term loan could mean you pay back much more than a shorter term commitment. If you need a larger sum of money, then a loan commitment structured over a longer period of time will probably be the better option if you want regular, manageable repayments. Can I afford a cash loan today? While instant cash loans are a fantastic option for convenient cash when you need it most, it is important to make sure that you can afford the loan you are applying for before you submit your online loan application. As a responsible broker, CashLady will carry out criteria checks and route your application accordingly but you should also take personal responsibility and calculate your monthly expenditures to make sure that you can comfortably afford the monthly loan repayments. Taking this pragmatic approach will help you understand your financial situation before you spend time completing an application form. Missing any cash loan payments could end up costing you significantly in interest and additional charges and you could get into trouble with your finances. There’s no restriction on what you need the money for so you can apply for anything as long as you’re borrowing responsibly and know that you can make the repayments. Best of all, quick cash loans can be useful in helping you keep your finances on the straight and narrow. Especially for preventing you from going over your overdraft limit and potentially facing up to a particularly intimidating bill. Used properly and responsibly, instant cash loans can be a very useful tool. Whatever your situation, it is crucial that you only ever deal with fully authorised, FCA regulated loan providers. Firms regulated by the FCA have been carefully vetted by the FCA (The governing body for all UK financial firms) and operate to the highest standards. 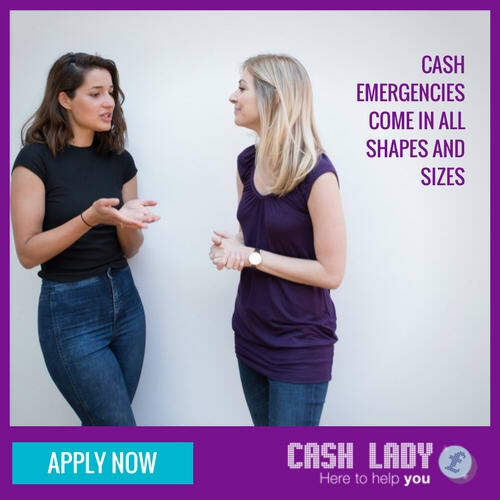 CashLady only ever works with FCA regulated short term loan providers and which means your cash loan application is only ever seen by our trusted partners. We can help you find the loan that is right for you and offer a simple, straightforward application process designed to give you fast, convenient access to the cash loan market. CashLady is at your fingertips through your computer or mobile device and we are here to help you when you need quick cash loans 24/7.